Saturday Market to open soon; Police Department sponsoring community 'shred event,'; and more. Sherwood will host a Global 6K for Water at 9 a.m. Saturday, May 19, at Stella Olsen Park.This is a fundraising event to provide clean water access for people across the world; in this case, the funds raised in Sherwood will specifically be directed to Congo, Africa. The 6K length is significant, as six kilometers is the average distance people walk to get water for their families and homes in the developing world. Northwest Senior Theatre will present "Love is On the Air," a variety show featuring Broadway songs, dancing and comedy, this month. All shows will be at the Aplenrose Dairy Opera House, 6149 S.W. Shattuck Road, Portland. The shows run at 2 p.m. on May 16, 17, 18 and 19. Tickets are $5 at the door, cash or check only. The Sherwood Saturday Market will open for the season on Saturday, May 5. The market runs from 9 a.m. to 1 p.m. at Cannery Square, and includes a range of local vendors selling produce, beverages, artisan goods and more. The Tigard Garden Club will hold its annual plant sale from 9 a.m. to 2 p.m. Saturday, May 12 at the Bull Mountain Farmer's Market at Canterbury Square, 1500 S.W. Pacific Highway, Tigard. Members will provide bargain-priced, healthy, generously sized plants including vegetables, herbs, flowers and garden specimens. The sale aids the club in supporting its ongoing charities, including an herb garden for Meals on Wheels, Caring Closet and Tigard Good Neighbor Center. The Sherwood Police Department and Pride Disposal will sponsor a Shred Event at the Sherwood Police Department from 9 a.m. to noon Saturday, May 12. Participants can bring up to two boxes of paper to shred and are asked to bring a minimum donation of two non-perishable food items. 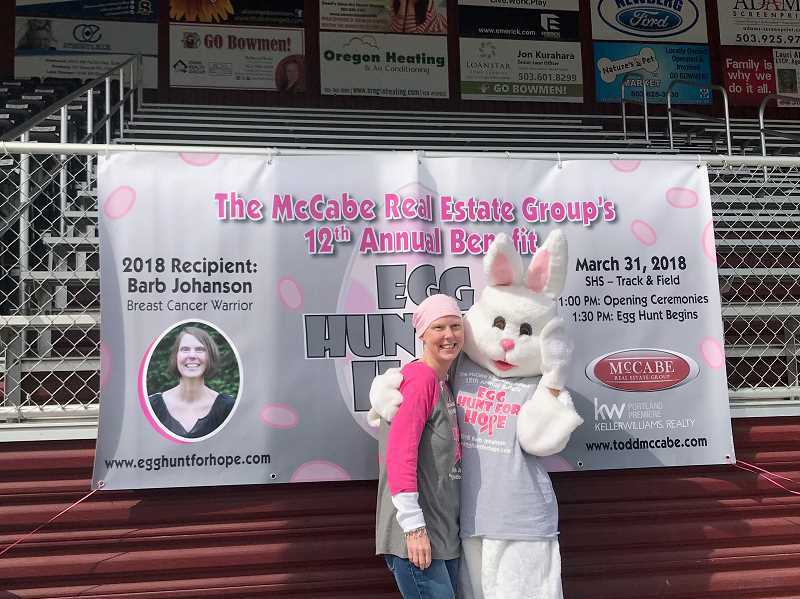 The McCabe Real Estate Group's 12th Annual Benefit Egg Hunt For Hope raised over $32,000 for Barb Johanson, a local Sherwood resident who is battling breast cancer. Johanson, who was a long-time Egg Hunt For Hope committee volunteer, was diagnosed last fall with an aggressive form of breast cancer that went into her liver. "A huge thank you to The City of Sherwood, Sherwood School District and Sherwood Booster Club for working alongside us to have the event at Sherwood high School's track and field. It is the perfect location for our annual benefit egg hunt," said Leslie McCabe, event founder. "We also want to thank the Sherwood Community Friend's Church for their continued partnership in handling all of the checks that come in for the event. This has been a huge help for us to raise money for the family. To learn more about the Egg Hunt For Hope, go to egghuntforhope.com or on Facebook, Egg Hunt For Hope.